Thirty years after the first diagnosis of HIV, nearly 30 million people have died worldwide from AIDS-related illnesses (that’s the population of Texas) and another 30 million are now living with HIV. Despite billions in annual research dollars, the quest for a vaccine remains elusive. A fatal form of pneumonia kills five gay men in Los Angeles. By the end of the year, 121 people are known to have died from GRID (gay-related immune deficiency). It is soon renamed AIDS. AZT, the first antiretroviral drug, becomes available to treat HIV. 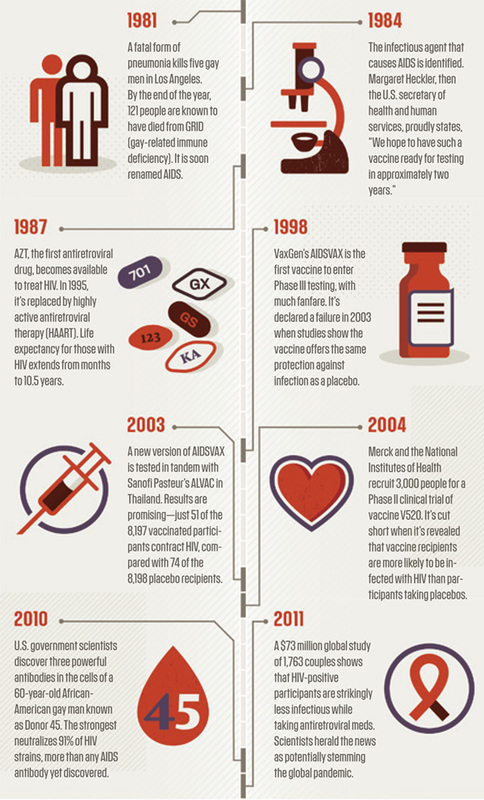 In 1995, it’s replaced by highly active antiretroviral therapy (HAART). Life expectancy for those with HIV extends from months to 10.5 years. VaxGen’s AIDSVAX is the first vaccine to enter Phase III testing, with much fanfare. It’s declared a failure in 2003 when studies show the vaccine offers the same protection against infection as a placebo. A new version of AIDSVAX is tested in tandem with Sanofi Pasteur’s ALVAC in Thailand. Results are promising–just 51 of the 8,197 vaccinated participants contract HiV, compared with 74 of the 8,198 placebo recipients. Merck and the National Institutes of Health recruit 3,000 people for a Phase II clinical trial of vaccine V520. It’s cut short when it’s revealed that vaccine recipients are more likely to be infected with HIV than participants taking placebos. U.S. government scientists discover three powerful antibodies in the cells of a 60-year-old African-American gay man known as Donor 45. The strongest neutralizes 91% of HIV strains, more than any AIDS antibody yet discovered. A $73 million global study of 1,763 couples shows that HIV-positive participants are strikingly less infectious while taking antiretroviral meds. Scientists herald the news as potentially stemming the global pandemic.